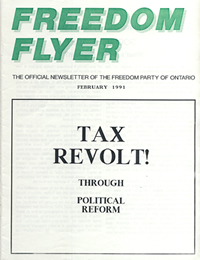 Freedom Party Launches ‘Ax the Tax’ Campaign; Special Anti-Tax Newsletter Published – The Tax Act; Socialism 102 – What’s Next? Fascism? – Commentary By Robert Metz; At Rope’s End – Tax Revolt In Ontario; Monteith Urges Citizens Not To Pay Tax Increase; Emery Resigns; Fp Launches Media Blitz; “High Costs, Taxes, Driving Jobs South” Says Frampton in Toronto Star Editorial.